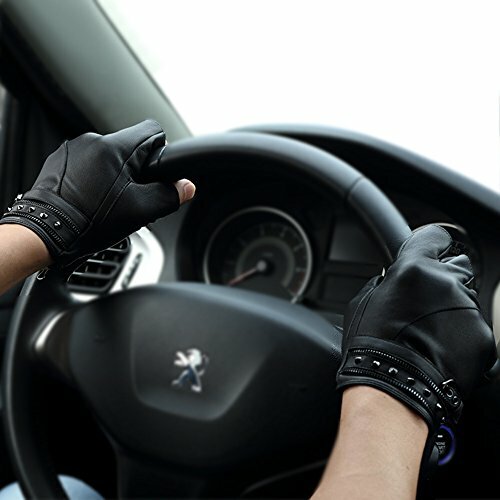 Why should wear our fingerless leather driving gloves? * Gift box packing -great gift for friends, son, dad and boyfriend, etc. How to measure your glove size? To find your glove size please make a half fist with the right hand if you are right-handed or your left hand otherwise. Measure the hand size around the palm, without the fingers, as shown in the images, and write down the measurement result. Choose the nearest size from the table to order the right glove size for you. This size chart (IN INCH) intended for reference only. Sizes can vary between brands. Size S= 9.5" (suggested palm circumference: 8.38 -8.70 in. )-Middle finger=0.94 in. 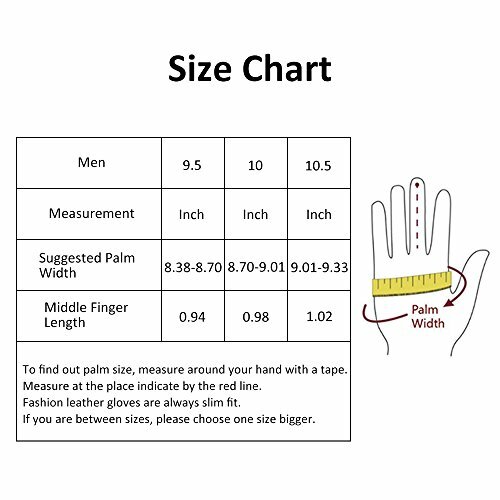 Size M=10" (suggested palm circumference: 8.70 - 9.01 in. )-Middle finger=0.98 in. Size L= 10.5" (suggested palm circumference: 9.01- 9.33 in. )-Middle finger=1.02 in. Gloves are sent when just finished, it is normal that the gloves may smell bad when you received it. You just need to place gloves at ventilated place several days. The smell will disappear. Multi-Purpose Genuine Sheepskin Gloves -Made from 100% genuine soft Italian sheepskin with stylish appearance, these leather gloves make the perfect accessory for driving, cycling, motorcycling, dressing, shooting, exercising in gym. 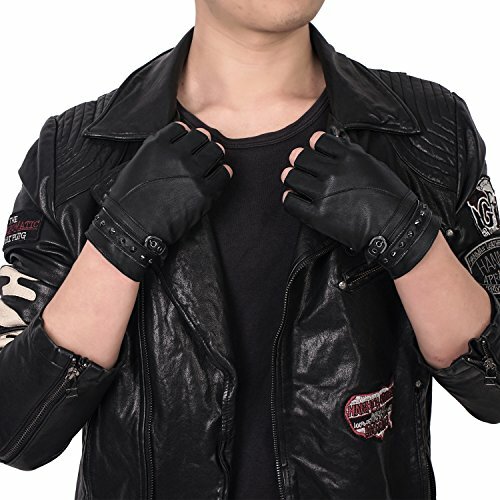 Cool & Fashionable Design - These mens leather gloves feature a strap and studded 7 high quality rivets design on the top, pair them with a black leather jacket and jeans will bring you cool feeling. You deserve to have! Flexible and Comfortable -The leather motorcycle gloves are very flexible and soft to offer the best gripping experience, you can wear them for a long time without experiencing any form of discomfort. 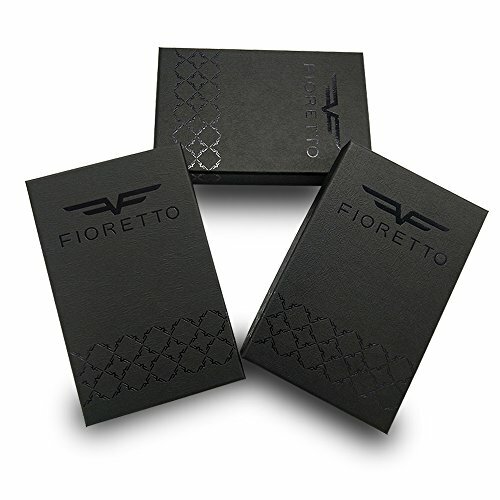 Size and Gift Box Packing - The warm leather fingerless gloves come in 3 sizes (S/M/ L) and in nice looking gift box which makes a best gift to your wife, daughter, mom and girlfriends etc. 100% Satisfaction Guarantee - If your new leather work gloves do not fit perfectly or are not what you expected simply returns them in their original, unworn condition for a replacement or a full refund with NO-QUESTION asked.